the failure of policies initiated by the forest department has led to a flourishing business for brokers involved in the sale of medicinal plants and non-wood forest products. This has resulted in the extensive destruction of biodiversity in Kotoor town of Kerala. An hour-long bumpy drive from the state capital Thiruvananthapuram brings one to a narrow road lined by small shops selling spices and medicinal plants. This is Kotoor's raw drug market - where trade is carried out in medicinal plants received in exchange for loans taken by members of the Kani tribe. The tribal cooperative society, under the Kerala government's department of forests, is supposed to handle trade in medicinal plants. But the tribals allege that the cooperative is also involved in the illegal sale of the plants.In fact, the tribals say that the brokers and the cooperative are involved in a tussle to grab the lion's share of medicinal plant collection from the tribals. This would result in giving them extra leverage to arm-twist pharmaceutical companies into paying more money from the plants. Velukutty, a local non-tribal resident, who has been interacting with the tribal population in the region for the past twenty five years, runs the cooperative society. He also advances money to those in need and describes himself as a saviour of the tribal population. "I lend them money whenever they need it and do not charge any interest. At any point of time I give away around Rs 20,000 to Rs 30,000. They return the money according to their convenience," he says, without batting an eyelid. The sale price of medicinal plants is higher than the government rates. The tribals have a different story to narrate. Money-lending for Velukutty is a lucrative profession and payment is from the forests. In one such case, Malangadi, a Kani tribal staying near the Kotoor forests says: "Velukutty bought a black and white television set for us and placed it in the local club for the youth. A few days later he came back and asked for five plants of a medicinal herb from each of us. A truck-load of the plants was then sold in the market earning him a huge profit." This is just one of the many ways of exploitation of medicinal wealth and the tribal population living in the area. In the absence of proper rules and implementation of policies, the biodiversity of the region is being plundered to subserve the financial interests of a select few. It is expected that the tribal population engaged in the collection of medicinal plants sell their collection to the tribal co-operative society and the government of Kerala fixes the prices given to them, periodically. But then these are all documented procedures to conduct the trade, the real story is not quite that simple. Exploitation by broker is being carried out in more than one way so that not only is the forest wealth being impoverished but the tribal population is also suffering. The local tribal population in Kotoor have a list of incidents to talk about, all of which point fingers towards the mode of functioning of these tribal authorities and the forest department as well. The official version, however, contradicts this situation. 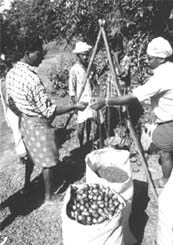 "With the aim of eliminating brokers from the collection and marketing chains of non-wood forest products and ensuring a fair price to the gatherers, the government established institutions such as tribal societies and an apex body of tribal societies like the Kerala State Scheduled Caste Scheduled Tribe Development Co-operative Federation Ltd (better known as Federation)," says N Sasdhidharan of the Taxonomy division of kfri . A study done by the Tropical Botanical Garden and Research Institute ( tbgri ), Thiruvananthapuram in 1996 revealed there was widespread depletion of biodiversity. "A study of 155 species of medicinal plants revealed that 25 of these species had already entered the category of very rare species and had almost disappeared from the markets," says V Santosh of tbgri . "There are species that have become highly depleted from the forests, an indicator of which is their high price. Trichosanthes cucumarina is one such example," indicated Shashidharan. To add insult to injury are the large scale conversions of natural forest lands for developmental works, implementation of plantation programmes and illegal collection by non-tribal which have further depleted non-wood forest products. "The International Union for Conservation of Nature (iucn) has enumerated 23 kinds of pressures that result in biodiversity loss. Out of these 14 are applicable to Kerala," reveals V Pandurang, head of the plant systematics and evolutionary science division of tbgri.